Over the last two years, veterans wounded in combat and youth interested in learning leadership skills through scuba involving marine science activities have been volunteering at Mote Marine Laboratory’s underwater coral nursery in the Florida Keys. Not only do these combat wounded and youth volunteers provide important support to Mote — accelerating the coral reef restoration work undertaken since 2006 — they also inspire and challenge one another in a way that only the undersea community can provide. Thanks to this ongoing partnership, Mote will be setting aside an area in our coral restoration site to honor American servicemen and women. In July, members of the Combat Wounded Veteran Challenge, SCUBAnauts International and the Gold Star Teen Adventures will be coming together with Mote scientists to work at this underwater site for the first time. “Our mission with this project is multi-faceted,” said Dr. Michael P. Crosby, President & CEO of Mote Marine Laboratory. 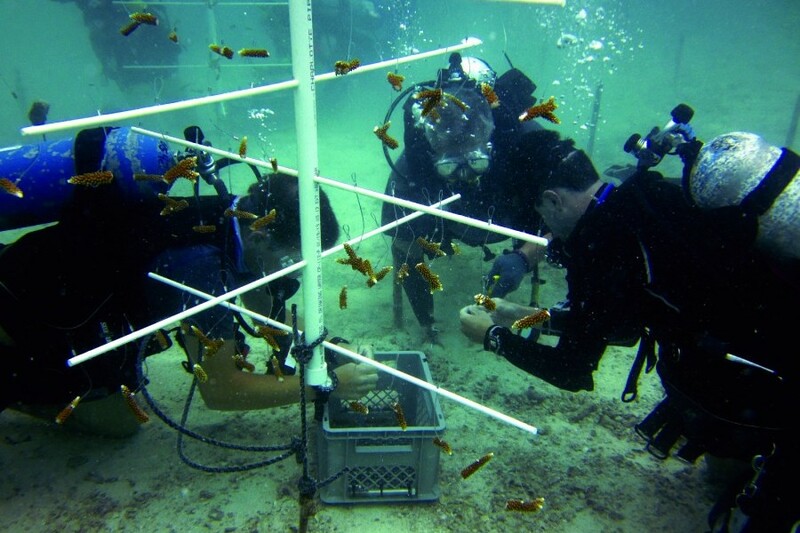 “Because we have the southernmost marine research laboratory in the nation, we’re dedicated to restoring the only barrier reef in the continental U.S. And, as an organization dedicated to helping the public understand ocean ecosystems and in supporting the next generation of scientists, we’re always looking for new opportunities to involve ‘citizen scientists’ — like the SCUBAnauts, like the Combat Wounded Veterans and the Gold Star Teens — in our research programs. More than seven years ago, Mote established our underwater coral nursery where scientists grow colonies of the threatened staghorn coral (Acropora cervicornis) for replanting on decimated or damaged sections of reef within the Florida Keys National Marine Sanctuary. When the colonies reach a suitable size, small fragments nearly 2 inches long (about 5 cm) are snipped off and used to create a new colony — similar to the way new plants are grown from cuttings of existing plants. Today, we have about 15,000 coral colonies — some 250,000 fragments — growing in our nursery. “Members of SCUBAnauts International and the Combat Wounded Veteran Challenge have been with us working in the nursery since 2012, coming out to help propagate coral and replant fragments in our transplant area near Looe Key,” said Erich Bartels, Manager of Mote’s Coral Reef Science and Monitoring Program who oversees the coral nursery project. Gold Star Teen Adventures provides adventure camps to the surviving youth of Army, Navy, Air Force and Marine Corps Special Operations personnel who have lost their lives in the line of duty. The Combat Wounded Veteran Challenge improves the lives of wounded and injured veterans through rehabilitative high-adventure and therapeutic outdoor challenges while furthering the physiological, biomedical and pathological sciences associated with their injuries. SCUBAnauts International’s mission is to guide young men and women ages 12 through 18 along an exciting pathway for personal development by involving them in the marine sciences through underwater marine research activities, such as special environmental and undersea conservation projects, that build character, promote active citizenship and develop effective leadership skills. “We are very grateful to Mote for providing this exceptional opportunity for combat wounded and injured veterans to show by example to our youth that their limitations are what they place on themselves,” said retired U.S. Navy Capt. David Olson, who founded SCUBAnauts and the Combat Wounded Veteran Challenge. This trip also provides SCUBAnauts with an opportunity to truly understand the meaning of overcoming challenges, said Jim Cassick, Executive Director of SCUBAnauts International. As part of this Challenge Expedition, Combat Wounded Veteran amputees will collect information and medical data in a partnership with St. Petersburg College of Orthotics and Prosthetics to contribute to the science of human performance, rehabilitation and recreation in extreme aquatic environments. Amputee veterans not already certified will be receiving their SCUBA certification from Divers 4 Heroes, a non-profit organization with the mission to introduce a gravity free environment, our underwater world, to all warriors who have been injured.... mind, body, or spirit. Special thanks go to the Guy Harvey Ocean Foundation, Oceanic Warrior Program, Divers 4 Heroes, Derby Lane and Dive Key West for supporting this effort. 2014 marks the third year that Mote Marine Laboratory has partnered with the Combat Wounded Veteran Challenge, SCUBAnauts International and the first year that Gold Star Teen Adventures participants are joining us. 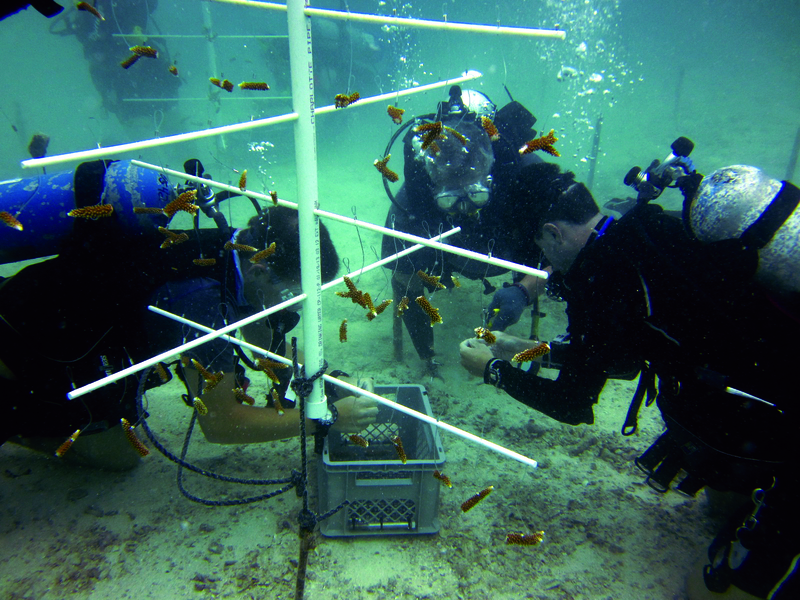 We are seeking funding that will allow us to expand our partnerships and provide additional opportunities for members of these groups to work with us in our underwater coral nursery. For information on how you can help, please contact Development Officer Jason Wolf at 305- 393-6022 or jwolf@mote.org.